Ministry of Religious Affairs, Chief Rabbi David Lau present four-step program Monday to standardize kosher certification by the state. Minister of Religious Affairs Naftali Bennett and his Deputy Minister Rabbi Eli Ben-Dahan, along with Ashkenazi Chief Rabbi David Lau, on Monday presented proposed reforms to Israel's Kosher [Jewish dietary laws] certification system. The reforms include several steps to standardize the current system, according to Bennett. 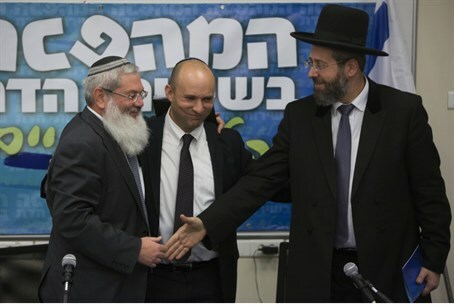 "The main problem is that the Mashgiach, the one who grants the Kashrut (Kosher) certificate, is employed by the Mushgach, the one who is receiving the kosher certificate!," Bennett explained in a Facebook post Monday. "It is a broken system, with no uniform standards." "The Reform consists of a four step program," he continued. The first step: separating the kosher supervisor from the business. "The Kashrut supervisor will be employed by a separate company that will be dedicated for that purpose, and not by the business itself," Bennett explained. Bennett also stated that three distinct levels of kosher certification would be established - and regulated by the State. "[The next step is] establishing three levels of Kosher: Standard, Mehadrin, and Mehadrin Min Mehadrin. This will allow each business to choose what level they want," he explained. "Additionally, this will allow the consumer to choose where they eat based on the level they are comfortable with." Then, the Ministry will "increase enforcement" of the new laws. Finally, Bennett says, the new system will eradicate confusion about the status of a particular establishment. Kosher certificates are displayed prominently at the counters of restaurants by law, but it can often be difficult to determine at first glance whether that certificate is genuine, whether it has been updated, and who issued the certification. That is about to change, said Bennett. "When you enter a restaurant you will be able to see clearly exactly what the certificate contains." At the press conference, Rabbi Eli Ben-Dahan noted that the reforms stem from a need to reassert the status of the Rabbinate's role in Kosher laws in the eyes of the Israeli public. "The ultimate goal of the 'kosher revolution' is to restore public confidence in the Rabbinate by providing full transparency, updating regulations, using better technology to determine Kosher status, cutting foreign interests and setting different levels of Kosher certification." the Rabbi and MK stated. "The move was made in collaboration with business owners, kosher consumers, the Israel Hotel Association and of course the Chief Rabbinate."